Maybe it’s the isolated location in the mid-Atlantic but this Portuguese archipelago consisting of nine volcanic islands is as unlike Europe as anywhere we’ve visited on the continent. The Azorean islands are situated way out in the mid-Atlantic and as far west as it is possible to go in Europe. Think of it like this; The Azores are not much further from Boston, Massachusetts than they are Harlow, Essex. They are also as unlike Europe as anywhere we’ve ever visited in Europe and during either our Three Island Tour or our week on Sao Miguel Island you will be able to see why. Volcanic eruptions formed the Azorean archipelago and on close inspection, you would be forgiven for thinking of Hawaii. There are volcanoes everywhere – to the extent that we have named one of our holidays here – A Volcanic Wonderland. The sense of dislocation grows as you gain elevation. Overlooking the deep lake-filled calderas and the endlessly lush green landscapes you could well think yourself in New Zealand or even Tolkien’s Shire. Urban centres such as the capital Ponta Delgada and Horta are a throwback to colonial times with grand, baroque buildings constructed from black basalt then painted white or blue. We are sure to include time to explore these towns during our holidays. Colonial Portugal, Hawaii, New Zealand or The Shire? You will certainly be forgiven for completely forgetting that you are still in Europe. For such a far-flung string of islands, The Azores dish out a broad range of activities and experiences. Whale watching and snorkelling with dolphins are usually list toppers. It’s particularly refreshing to see the mammals rather than the humans determining the amount of interaction. Basically, if they get bored, they just swim off. The locals have found some very interesting uses for their volcanic resources. At Furnas, local restaurateurs slow cook a stew called Cozidas in metal pots buried in the warm earth. Visit Setes Cidades and you can cycle on the shore of a crater lake and then kayak on the lake itself. At the Terra Nostra Botanical Gardens you can bathe in the warm iron-rich waters of a thermal pool (use old swimwear because it will come out stained) and, if you prefer your hot springs to be saltwater, then a dip in the ocean at Ferraria provides the alternative. On the islands, life moves at an even gentler pace but that doesn’t mean you’ll become bored any time soon. A jeep tour on Faial includes Caldeira where 7km of volcano walls form a spectacular amphitheatre for a series of small lakes and a smaller volcanic cone. Basically, it’s a volcano within a volcano! São Jorge is renowned for its excellent walking and there can be few better hikes than the one that starts at 700m atop Serra do Topo. The coastal views are second to none and there’s even a chance to bathe in a thermal pool during the descent. Last, but by no means least is Pico. Your base here is the town of Madalena which is dwarfed by Pico Volcano, the highest volcano in the Azores and, at 7800ft, the tallest mountain in all of Portugal. Equally surprising is the UNESCO World Heritage Site Criação Velha vineyard where linear networks of black stone walls protect the vines from the elements. It is one of the most remarkable man-made landscapes we have ever encountered. The wine isn’t too shabby either! *Azoreans reckon that their cows are terribly happy because they enjoy the best views in the world. It’s a fair claim! They love parks and gardens here in the Azores and from May through to October, the islands are a riot of colour as the abundant hydrangeas bloom. You can see them absolutely everywhere; bordering the roads and delineating tea, banana and pineapple plantations as well as the fields where “the happiest cows in the world*” languidly graze. São Miguel is the largest of the nine islands but not so large that you can’t explore most of it in the space of seven nights. The capital Ponta Delgada is the perfect base with a fabulous range of restaurants - Portuguese Tapas is the way to go – bars and cafes as well as being the starting point for whale watching and snorkelling with dolphins. Inland, the Terra Nostra Botanical Garden in Furnas - yes, it translates to furnace - is very probably the most relaxing and therapeutic place on the planet. At ‘Lagoa das Sete Cidades’ (Lagoon of Seven Cities) the view of two crater lakes surrounded by densely forested caldera slopes is simply spectacular. Mind you, that tends to be the case from practically any vantage point on São Miguel. If you fancy a taste of life away from the largest Island then look no further than our three island holiday. 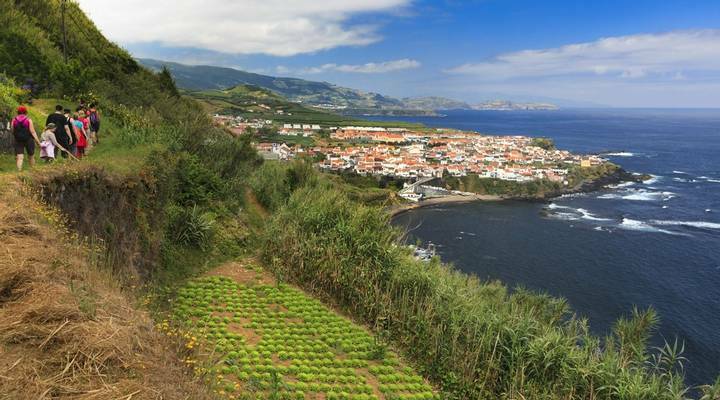 Visiting the triangle of Faial, São Jorge and Pico provides the perfect insight into Azorean island life as well as showing off some of the archipelago’s most outstanding volcanic landscapes. And, if you ever tire of the spectacular land and seascapes, there’s even a UNESCO Heritage Site vineyard on Pico. Visit and tasting compulsory! Sitting in the middle of the Atlantic Ocean is Portugal’s nine-island archipelago, The Azores. The very name Azores sounds exotic. It certainly doesn’t sound like the islands are part of Europe but and once you are there, it’s often hard to believe that you are not in somewhere far further flung like Hawaii or New Zealand. Tourism has yet to reach The Azores in a particularly big way and even in Ponta Delgada, the capital of the largest island, Sao Miguel, you will see little to suggest that visitors are impacting in any significant manner. However, that doesn’t mean there isn’t plenty to see and do here. The waters that surround the islands are popular spots for dolphins and whales. You can even go snorkeling in the ocean with the dolphins and visitors have reported seeing pods of up to 200 animals. Best of all, however, the interaction with the animals is done on their terms rather than in some commercial and restricted environment. It’s simple, if the dolphins want to swim with you then they will. If they don’t, good luck keeping up with them as they glide into the blue depths below! The Azores are volcanic islands and inland, the landscapes are nothing short of breathtaking. They also lend themselves to active exploration. At Sete Citades, you can cycle along the edge of a volcano and enjoy a thrilling descent before kayaking on the volcano’s lake? There are gentler pursuits to be enjoyed too. The Portuguese islanders love their gardens and you’ll struggle to find anything as therapeutic as an afternoon spent strolling around the botanical park at Furnas. Life out on the smaller islands such as Faial, São Jorge, and Pico moves at an even slower pace but there is no let up when it comes to landscapes. This is a fabulous country for walking or jeep tours and, on Pico, you can even visit Criação Velha vineyard which is listed as a UNESCO World Heritage Site; tasting is included, naturally!